A stunning entry of some 250 historic race cars has been received for the 18-race programme at this coming weekend’s (6-7 August) Nostalgia event at the Croft Circuit in North Yorkshire. Race organiser, the Historic Sports Car Club, has also confirmed entries for its Formula Junior single-seater category and Guards Trophy race for GT and sport-racing cars are at maximum capacity with 30-plus grids guaranteed for both. 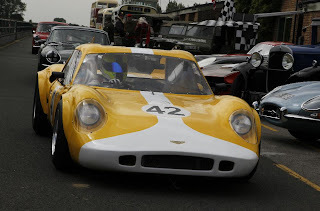 Furthermore, the event’s charm – a heady mix of motoring, motor racing and lifestyle themed from the Forties through to the Seventies that attracts large numbers of public dressed in period style – has also drawn competitors from as far afield as Belgium, Finland, France, Germany and Sweden. But they will have to beat a number of local racers all eager to shine in front of their home crowd – among them 18-year-old James Buckton from Harrogate in his historic Elden Formula Ford, York’s Robert Rook and Selby’s Jim Clark in their Ford Lotus Cortinas, fellow saloon car racer Andy Yool from Barrow-in-Furness in his Ford Anglia, Workington’s Robert Gates in his evocative E-type Jaguar and Whitley Bay’s Richard Evans in his sensational March Formula 2 car. There's also 'adopted local' Nick Fleming from Upper Largo, Fife in his stunning Chevron B8 sportscar. 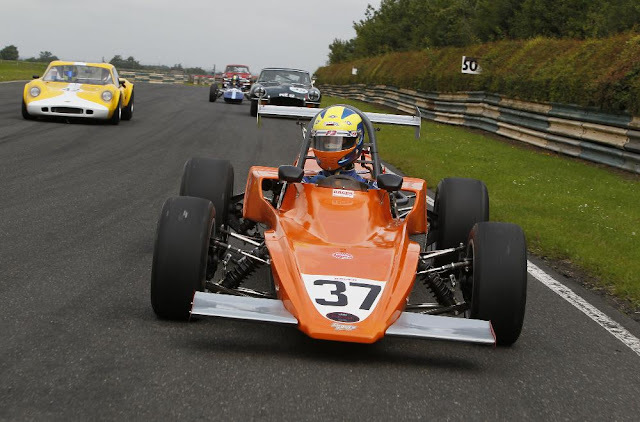 Evans will be among the favourites to win one of the two headline trophies up for grabs – the Derek Bell Trophy which consists of races on both Saturday and Sunday for historic Formula 5000 and Formula 2 cars. Fleming meanwhile will be chasing honours in the sister headline-grabbing Guards Trophy, a 40-minute race on Saturday. “In terms of numbers of race entries and the activity we are packing into two days on the track, this will be the biggest event of the year here at Croft,” commented Circuit Manager Tracey Morley. “Pretty much every inch of the site will be covered by race teams and their cars, exhibits, displays and entertainers. Indeed, off-track the line-up of entertainment is staggering. Getting a bird’s eye view of the Croft Circuit will be pilots of Spitfire and Hurricane WWII fighter planes that will provide thrilling aerial displays on the Saturday – replaced on Sunday by a Jet Provost from the Seventies. On the ground, taking centre stage will be a classic car show – organised by the Teesside Yesteryear Motor Club, more than 400 pristine models of car along with a variety of motorcycles and buses from the period will drive into Croft Circuit for a mouth-watering display. 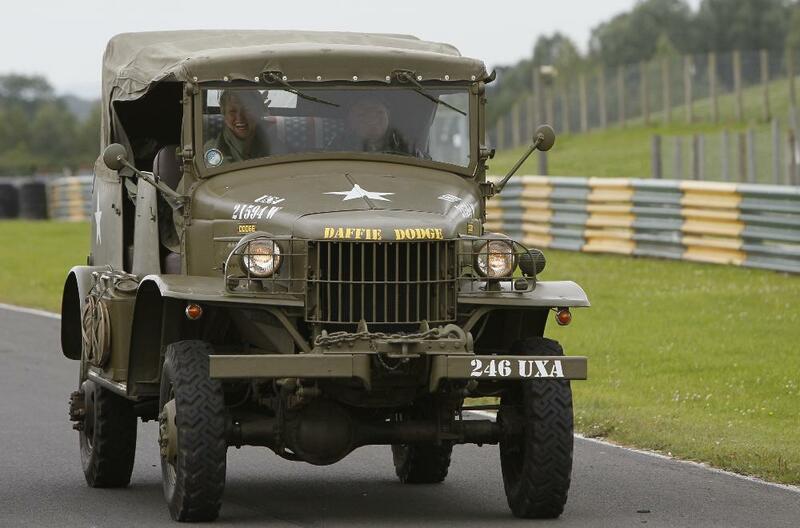 In addition, a huge array of WWII military vehicles will be on show. 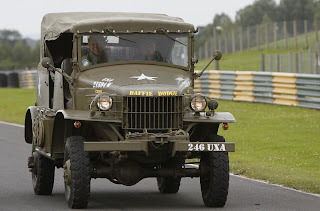 Arranged by the enthusiastic Military Vehicle Trust, these now total some 100 jeeps, cars, trucks, weapons carriers, motorcycles, fire engines and even aircraft. Other highly entertaining side shows including living history, fashion and music – featuring a George Formby act – plus rides around the race track on the Sunday morning in buses from the Forties will further add to the event’s authenticity. Tickets for Croft’s Nostalgia weekend are priced: £12 Saturday; £15 Sunday or £22 for a weekend pass. Admission for children aged 15 and under is FREE all weekend. Car parking is also free. More information is available from the Croft Circuit office on 01325 721815 or website www.croftcircuit.co.uk.